California wine country is a vast patchwork of wine zones. Whether or not they have American Viticultural Area, or AVA, status (denoting a region where the wines have distinctive character), many new spots have enormous potential. 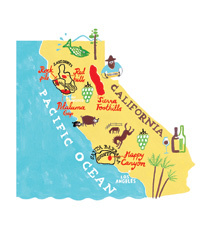 Here, the new California wine country region names to know. Sonoma's Petaluma Gap lies in what is effectively a wind tunnel between the Pacific Ocean and the San Francisco Bay. It isn't yet an official AVA, but many people think it deserves to be on the strength of its cool-climate Pinot Noirs, Chardonnays and Syrahs. 2007 Keller Estate La Cruz Vineyard Pinot Noir ($44) When Keller Estate opened in the Petaluma Gap in 2000, it was the first winery in the region (there had been vineyards there for quite some time). 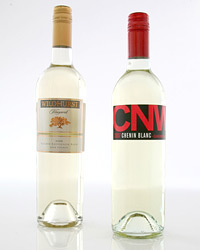 Its 86 acres of grapes include top-quality Chardonnay and Pinot Noir, which go into bottlings like this crisp, raspberry-inflected red (above). 2008 Cline Cool Climate Syrah ($16) The area's chilly winds push this Syrah toward a taut, peppery style. Aging in a small percentage of new French oak barrels adds complexity. 2008 Gallo Family Vineyards Two Rock Chardonnay ($28) This single-vineyard bottling is a perfect example of the region's potential for creating sleek, nuanced Chardonnays. The Red Hills Lake County AVA, north of Napa Valley, got a recent boost when star Bordeaux winemaker Stéphane Derenoncourt chose to make one of his first California wines with Red Hills grapes. But local growers have long known how well Cabernet grows in the rocky, volcanic soil here. 2008 Shannon Ridge Ranch Collection Cabernet Sauvignon ($19) Red Hills grapes were blended with others from High Valley (another Lake County region) for this full-flavored red. 2005 Snows Lake One Cabernet ($45) Snows Lake's high elevation keeps temperatures cool, making for balanced Cabernets like this one. 2008 Steele Cabernet Sauvignon Red Hills Lake County ($29) Jed Steele, a pioneer in Lake County, draws from one of the region's top vineyards, Amber Knolls, for this focused Cabernet. 2007 Obsidian Ridge Half Mile ($60) The unusual spice notes of Hungarian oak and a bright floral lift from a high percentage of Petit Verdot make this Cabernet blend extremely compelling. Winemakers have been here since the Gold Rush days, but only recently has this northeastern California wine country region come into its own. Look for full-bodied reds from the El Dorado, Shenandoah Valley and Fiddletown subregions. 2007 Vinum Cellars The Scrapper Cabernet Franc ($30) The boxer on the label is an appropriate image, given this wine's rough-and-tumble power (above). 2005 Miraflores Syrah ($30) Winemaker Marco Cappelli makes a number of vivid reds from this family-owned winery's El Dorado vineyards, among them this brawny, rustic Syrah. The Rockpile AVA is one of Sonoma County's least known and most sparsely planted: There are only 160 acres of grapes on its 15,400 acres of land. But its profile may change once more people taste the powerful Zinfandels made here. 2007 Carol Shelton Rocky Reserve Zinfandel ($33) Sweet blackberry and cherry flavors and a lush texture make this red ideal for winter roasts. 2008 Rockpile Rockpile Ridge Vineyard Zinfandel ($35) The Mauritson family was one of the first to plant vineyards here back in 1884. 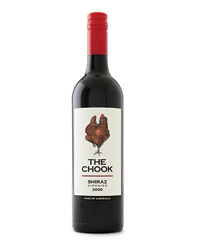 This red is classic Rockpile: dense, dark, spicy and powerful. Happy Canyon, on the eastern edge of the Santa Ynez Valley, is one of the newest AVAs in the state. But the California wine country region's ability to produce superb Sauvignon Blancs and Cabernet Sauvignons has already been attracting serious attention. 2009 Vogelzang Vineyard Estate Sauvignon Blanc ($28) Happy Canyon's climate gives Sauvignon Blanc a sleek, rounded texture, as in this citrusy wine (above). 2008 Margerum Sybarite Sauvignon Blanc ($21) Doug Margerum, a former Santa Barbara restaurant owner, was an early proponent of Happy Canyon. Now he's making his own impressive wines. The Calistoga subregion of Napa Valley was only recently approved for AVA status, despite decades of producing world-class Cabernets. The new AVA won't start appearing on labels until later this year, but in the meantime, here are three great Calistoga wines to try. 2006 Chateau Montelena Estate Cabernet Sauvignon ($135) Winemaker Bo Barrett, whose elegant, layered Cabernet epitomizes the region's wines, led the drive for the Calistoga AVA. 2008 Larkmead Vineyards Cabernet Sauvignon ($60) The vineyards for this floral Cabernet were first planted 120 years ago(above). 2007 Storybook Mountain Vineyards Antaeus ($40) Zinfandel and Cabernet Sauvignon combine in this powerful red.